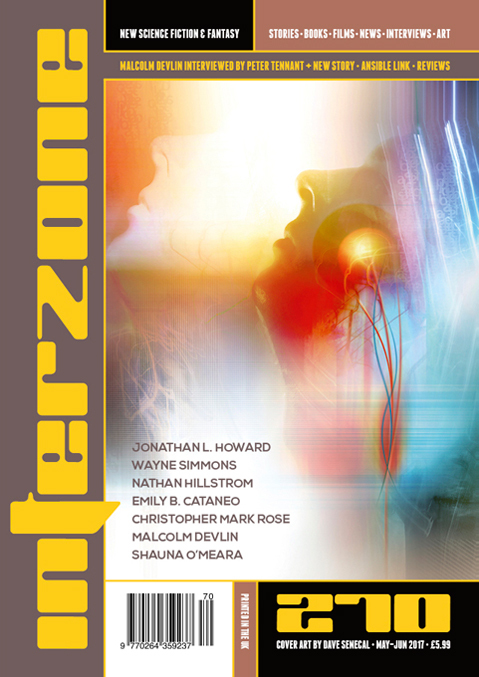 "Evangeline and the Forbidden Lighthouse," by Emily B. Cataneo [bio] (edited by Andy Cox), appeared in Interzone issue 270, published on May 15, 2017 by TTA Press. Pro: The story is about how during childhood, the world seems full of promise and anything is possible, but as we grow older, the options go away until all of life seems predestined. The messages in the bottle turn this idea into concrete reality. The Lighthouse is a one-way trip to another world. It seems to symbolize suicide—the only way out of the game. Predestined it might be (as the story says), but the friendship between Cady and Evangeline is very real. It feels just like a childhood friendship. The random way they meet, the way it survives occasional quarrels, and the way it fades away as they grow up. Evangeline fiercely resists the idea of an unchangeable future. She doesn’t want her life to change in ways out of her control. Her message doubtless says that today Evangeline will depart for the Lighthouse and never return. Cady never reconciles herself to her fate. Although she fulfills everything in the message’s prophecy, she returns to seek the Lighthouse for herself. Con: Cady isn’t much of a protagonist; she’s not trying to accomplish anything until the final paragraphs, where she's abandoning her husband and her small children who need her. These prophecies would be easy to break because they’re so specific. Evangeline would do better to try to defy the message rather than fulfill it. This was a beautiful story; I'd easily give it four stars. I have to argue with you about the ending, though, as I think that you've misinterpreted it. I don't think Evangeline's message (which she found on her Christmas visit, not the last day of her visit the following summer) said anything about trying to reach the lighthouse and not coming back: it told her that she was going to die shortly after moving to California with her parents, presumably of natural causes. That's what Cady's musings about the fragility of even young bodies after she (but not the reader) sees the message Evangeline found are meant to convey. (Cady thinks: "I wondered where she would be when it happened. I wondered if it would hurt.") So when Evangeline makes her attempts to row out to the lighthouse, she's not fulfilling the prophecy, she's defying it. Evangeline asks Cady to come with her because she loves her (the story isn't really ambiguous about Evangeline's sexuality) and she doesn't want to leave Cady to the drab life that's so different from what she'd dreamed of with Evangeline. That's part of the reason that Evangeline is upset to the point of tears on her Christmas visit when Cady finds the messages about her future, and why she insists that they can change things. It's not just that she learns that she's going to die in the near future, it's that she learns how Cady's life will turn out without her. At one point in the story Cady says that she needs Evangeline in order to be curious and brave, and the story makes clear that no one else in Cady's life - not her mother, not (in the future), her husband and children - really know her at all. When Cady heads back to Fox Sands at the end, it's because she's finally worked up the courage she didn't have fifteen years earlier, and chosen the chance of a life with Evangeline. You could argue that this is also an admission that she was in love with Evangeline, too, and still is, but the story is more ambiguous about that. It's also worth noting that at this point she's moved past her prophesied life, so who's to say what will come next?